Redbud trees belong to the genus Cercis, which includes deciduous trees from North America, Asia and the Mediterranean area. The leaves on redbuds are heart-shaped and produce fiery fall colors in red and yellow. The flowers are typically bright and range from pale pink to purple and magenta. Each small bloom grows along a branch to create a showy display. 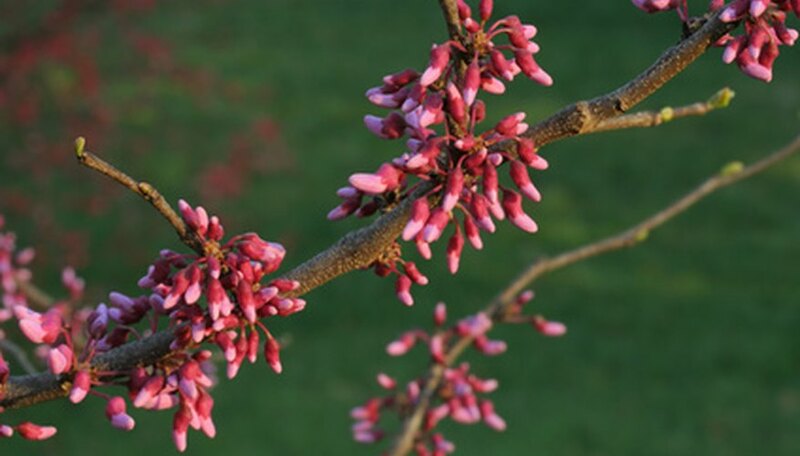 Grown as a specimen tree or in masses, redbud trees are a quintessential spring-blooming tree. California redbud (Cercis californica ssp. Californica), a variety of redbud tree, grows 10 to 18 feet tall and 10 to 15 feet wide. California redbuds are deciduous trees with a medium growth rate and upright form. The deep pink flowers emerge in spring to light up the tree with color. The blue-to-green leaves on California redbud trees grow 1 to 3 inches long and turn pale yellow to red in fall. California redbud trees require full sun to part shade and moist, well-drained soil. They are also drought-tolerant trees that are ideal to grow in arid climates where moisture is limited. Plant California redbud trees in USDA Hardiness Zones 7 to 9. Chinese redbud (Cercis chinensis) is a deciduous tree with an upright form. It grows 8 to 12 feet tall and 6 to 8 feet wide and has a moderate growth rate. Chinese redbud flowers are rose to purple and bloom in spring. The dark-green, heart-shaped leaves grow 5 to 6 inches long and cast a yellow tinge in fall. Chinese redbud trees are easy to transplant if moved to other areas of the garden. They require full sun and grow in a range of soil varieties, making for an adaptable redbud tree species. Plant Chinese redbud trees in zones 6 to 9. Mexican redbud (Cercis canadensis ssp. Mexicana) trees have a rounded and dense form that is broad and compact. The stems on Mexican redbuds are thicker than other redbud species, as well as more rigid. They grow 15 to 25 feet tall and have pink to purple spring-blooming flowers. The dark-green, leather-like leaves on Mexican redbud trees grow 2 to 6 inches long and have a glossy appearance as the tree ages. Mexican redbud trees require full sun to part shade and well-drained, moist soil. Plant Mexican redbud trees in zones 6 to 9. Oklahoma redbud (Cercis canadensis ssp. Retisus) is a deciduous tree with a moderate growth rate and medium-to-coarse texture. Growing 20 to 30 feet tall and 15 to 20 feet wide, Oklahoma redbuds have a rounded, dense form. Its bright-green, glossy, heart-shaped leaves are leather-like and turn yellow in fall. A mass of pink blooms emerges in spring on Oklahoma redbud trees. They require full sun to part shade and a range of soil types. Plant Oklahoma redbud trees in zones 6 to 9.